Saint George's Keep Self-cateringThe six individually designed luxury apartments offer choice of one and two bedroom accommodation and are specified to the very highest standard including state of the art appliances, spa bath, flat screen TV and Wi-Fi enabled. Welcome pack on arrival. Located within the city walls, Saint George's Keep is adjacent to Clifford's Tower and the York Dungeon and is in walking distance of most of York's famous attractions and landmarks. Disabled access- passenger lift to all floors SECURE CYCLE STORAGE Children welcome from any age. 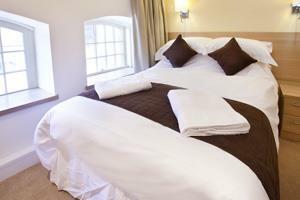 Saint George's Keep offers weekly bookings starting on any day and sometimes short breaks. Luxurious 2 bedroom apartment, (1 double & 1 twin, can be made to king size if required) Whirlpool spa bath with shower, dishwasher, all bed linen, towels, toiletries provided, cot/high chair on request. Fairfax offers weekly bookings starting on any day and short breaks of 2 or more days starting on any day. Luxurious 1 double bedroom apartment. Whirlpool spa bath with shower, dishwasher, all bed linen, towels, toiletries provided, cot/highchair available on request. Knavesmire offers weekly bookings starting on any day and short breaks of 2 or more days starting on any day. Luxurious 2 bedroom apartment, (1 double & 1 twin, can be made to kingsize if required) Whirlpool spa bath with shower, dishwasher, all bed linen, towels, toiletries provided, cot/high chair on request. Micklegate offers weekly bookings starting on any day and short breaks of 2 or more days starting on any day. Situated on Clifford Street within the city walls.